In addition to owning a home security system, there are many things you can do to make your home as safe as possible! Helping to protect your home with an ADT monitored home security system is just the first of many valuable home security precautions. Below are some general home safety tips that can help keep your home and family free from harm. 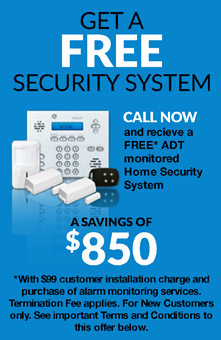 Protect Your Home is an ADT Authorized Dealer. Don't be too casual about your doors and windows; unlocked doors, open windows and unsecured garage openings invite criminals to target your home. A home security tip that is surprisingly often overlooked is to make sure all your doors are securely locked whether you are inside your home or not. Be sure that your locks are in good repair as well. Compromised locks, worn old doors and weak window casings can be too easily tampered with. Place a safety bar along the inside track of sliding glass doors and ground-floor windows; this can help prevent them from instantly sliding open should an intruder disable their locks. Keep ground floor windows closed and locked even in warm summer months. Investing in a quality air conditioning system can help to enhance your home security efforts. Open windows are always a threat to home safety. Use home security equipment such as motion sensors, to help cover your doors and windows so that you are immediately alerted if they're opened. Protecting all points of entry is a smart way to help keep crime away from your family and make the most of your home security systems. Most criminals don't like to work hard, and an empty house always looks like an easy target. If you are away from home for a few days, or longer, ask a trusted friend or neighbor to pick up mail and collect newspapers so they don't stack up on your front porch. Select someone who will keep quiet about the fact that you are out of the house. Never leave a note on your door mentioning that you're away. If this information falls into the wrong hands it can be an invitation to break into your residence. Of course, it's advisable to never ever leave a spare key anywhere outside, no matter how well hidden you imagine it to be. If you're going to be gone overnight or have to come home late it can help to have lights and a television or radio set on timers. Close up blinds and curtains at night or when you're out so no one can look inside. Anything you can do to give your place a lived-in look can eliminate the vacancy signs that criminal minds watch for, and help to improve your home's security. Home is a place where most of us unwind and relax, but it's important that we not relax our vigilance about fire safety. A few common sense tips like putting out cigarette butts thoroughly before placing them in the trash, never leaving candles burning unattended and double, or triple, checking that you've unplugged irons, hair curlers and other small appliances before leaving the house can prevent tragic accidents and loss. Using fire resistant materials when building or adding onto your home, as well as in decorating projects, can help to increase your family's safety as well. Regularly clear away dry leaves, old branches, and dead grass from your landscape. If you store firewood in the yard, make sure it's kept a safe distance from your house. Make sure that your family has a well rehearsed escape plan should a fire break out. Knowing how to handle an emergency can save lives! Also be certain that your address is easily visible from the street; this can help the fire department find your home easily if they need to come out to assist you. Test the batteries in your home's smoke and heat detectors monthly and replace them as soon as their power starts to run low; you never want to risk your household safety to poorly functioning fire alarm systems. Bring security home by exercising care and caution when it comes to fire safety. Being mindful of potential hazards is an excellent means of improving your home security. *Be sure to check back often for new articles and blogs about home security and family safety!